At the City Council’s August 9, 2018 business meeting, Councilmember French thanked all the residents who have worked so hard to help bring this new proposed City ordinance to reality, and especially the on-going years of support from LFP resident Jean Robbins and Councilmember Mark Phillips. Ordinance 1181 will undergo minor revisions as per suggestions from other Councilmembers, and on September 13, 2018, a Public Hearing will be set with the revised Ordinance for consideration of a Council vote at that same meeting. City Councilmembers previously discussed a plastics restriction during their May 21st Council Committee of the Whole (COW) meeting. Councilmember French stated that he has been compiling and analyzing information on plastic data from many resources. He spoke of his personal experiences as a scuba diver where he witnessed sea turtles eating plastic, and he stated, that even in remote areas where no humans are living, plastic waste is found. Plastic bags can take 500 years to degrade in a landfill, never breaking down entirely, instead becoming microplastics that continue to pollute. When plastics break up in the water, they release chemicals that can become toxic such as bisphenol A (BPA) which can enter the food chain or even possible water supplies. Microfibers from the plastics are now found everywhere on the planet, and we may even be consuming them in our food and our drinking water according to scientists. A representative from the Town Center fishing store “The Avid Angler” showed City Council their store compostable paper bags and also suggested that there be more recyclable containers placed throughout the Town Center. Waste Management reports that only 1 percent of plastic bags are returned for recycling. These bags are a constant problem for all recyclers. They fly off the conveyer belts and get stuck in the equipment, creating costly stalls in their operations. 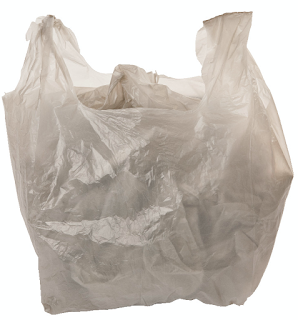 Plastic bags should not be put in blue recycle containers. In LFP, the bags can be recycled at Albertson’s plastic bag recycling bins.